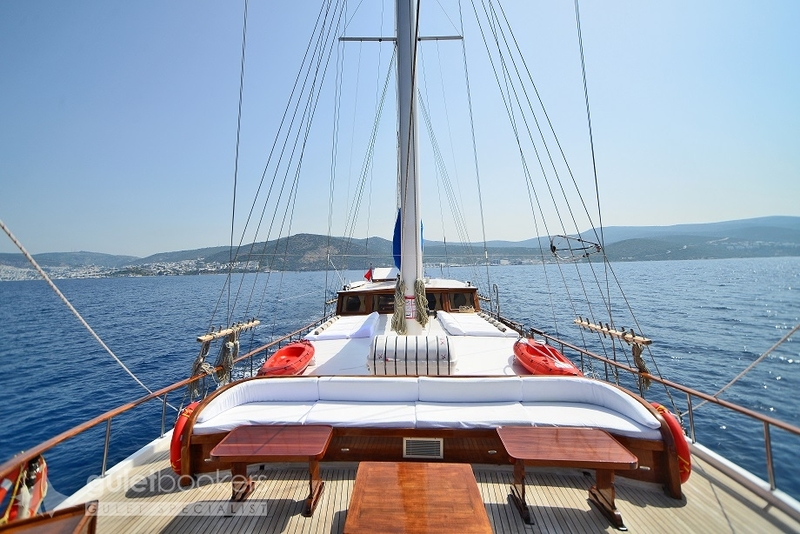 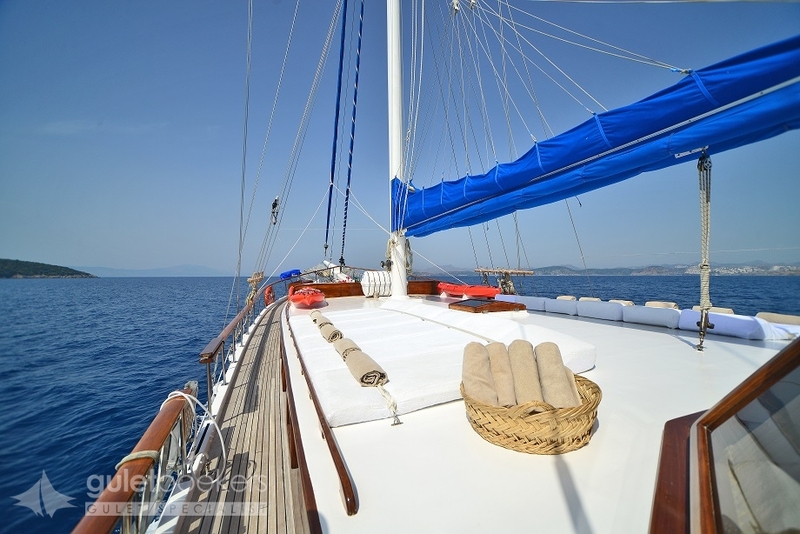 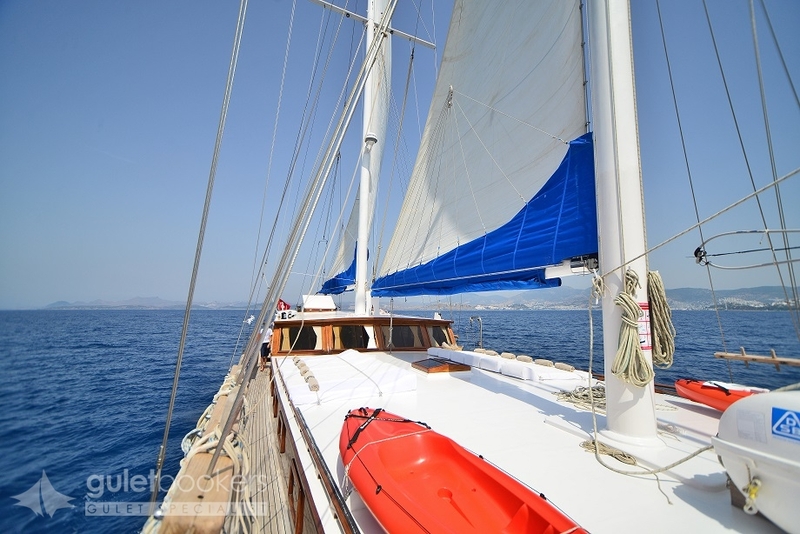 The Salmakis gulet bears the pure lines of a ketch wooden sailing yacht of the Aegean marking it as a classic standard gulet of its kind. 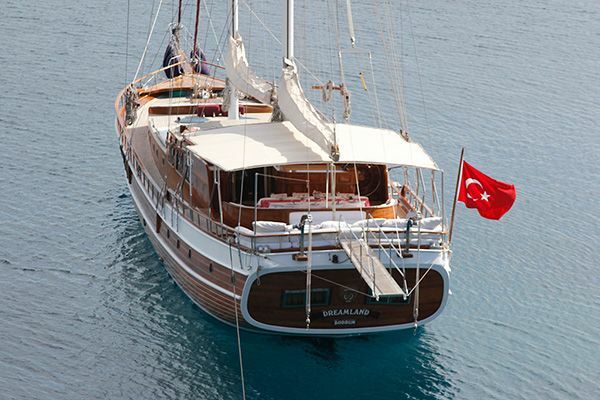 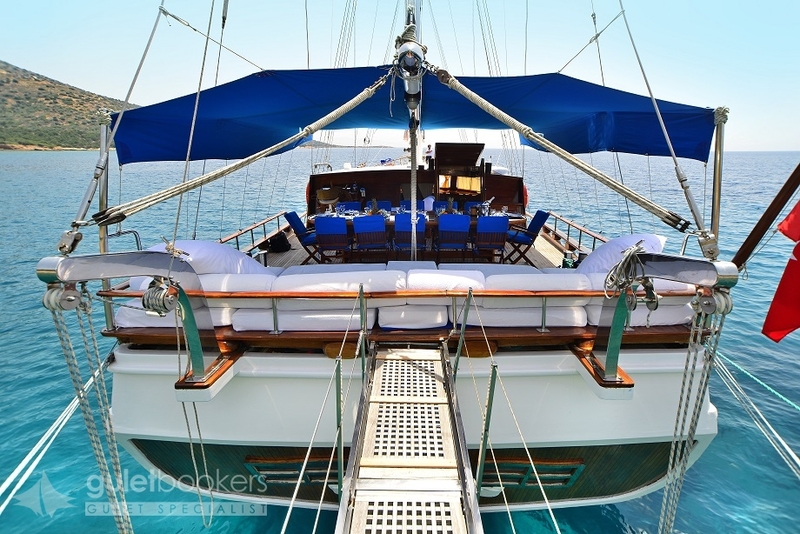 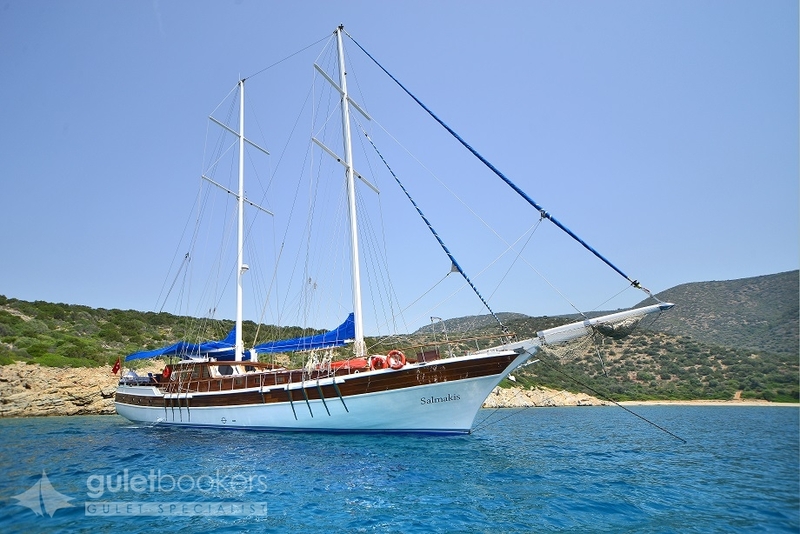 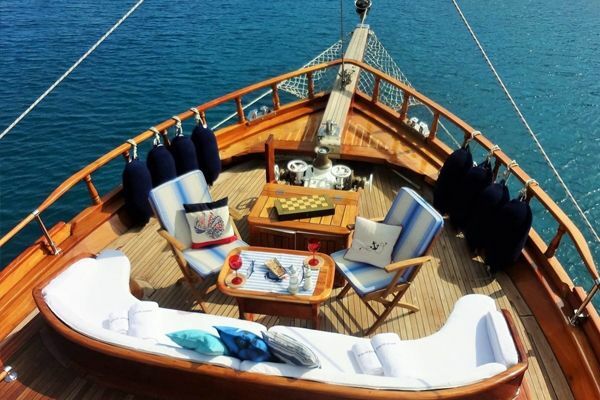 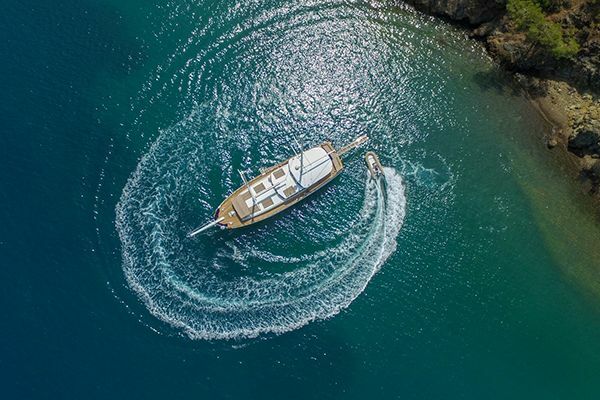 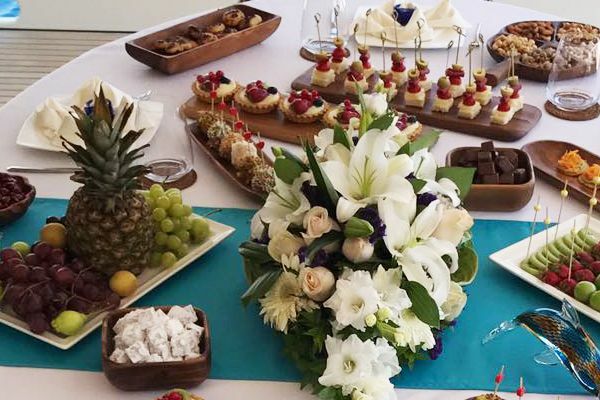 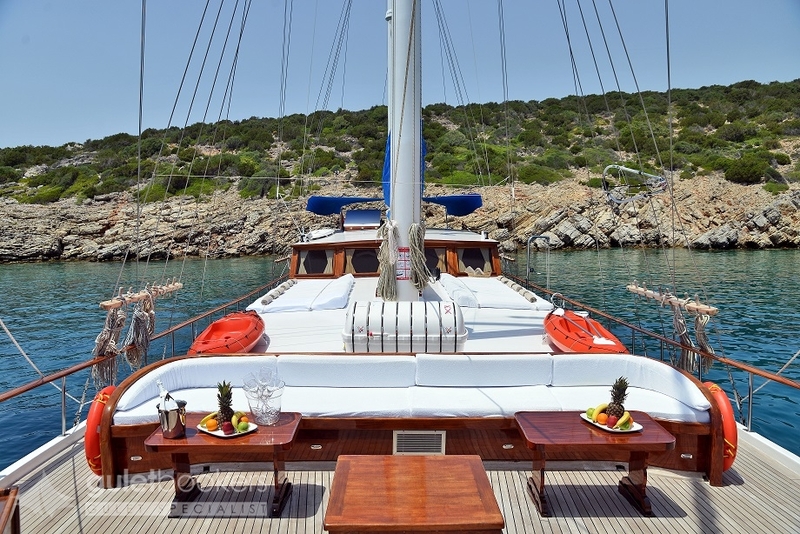 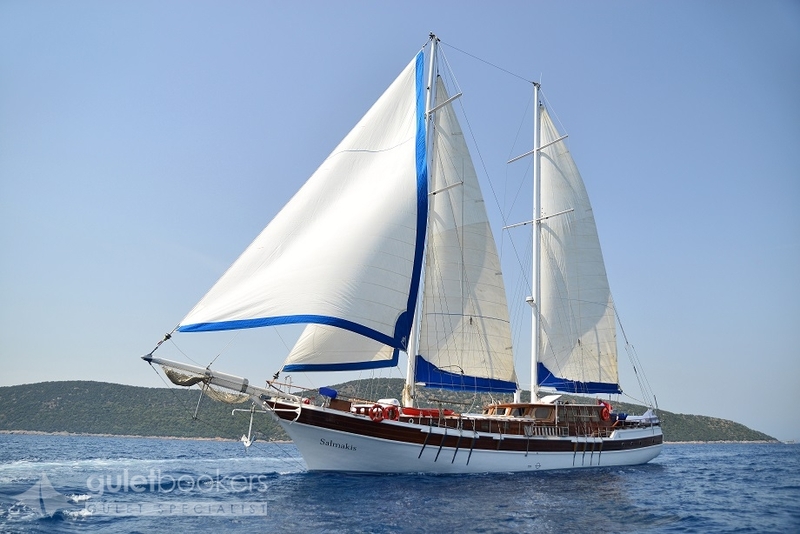 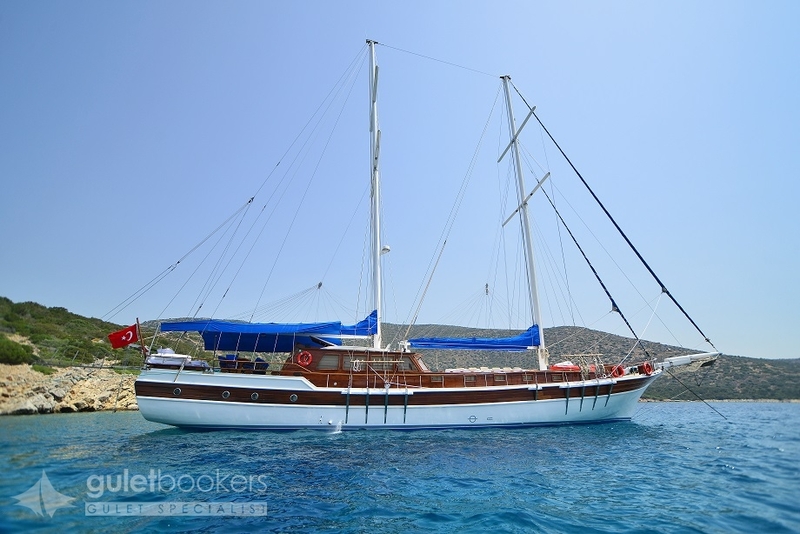 Immaculately maintained and crewed professionally, it is a firm favourite with regular visitors to Bodrum, the Turkish coast and the nearby Greek Islands. 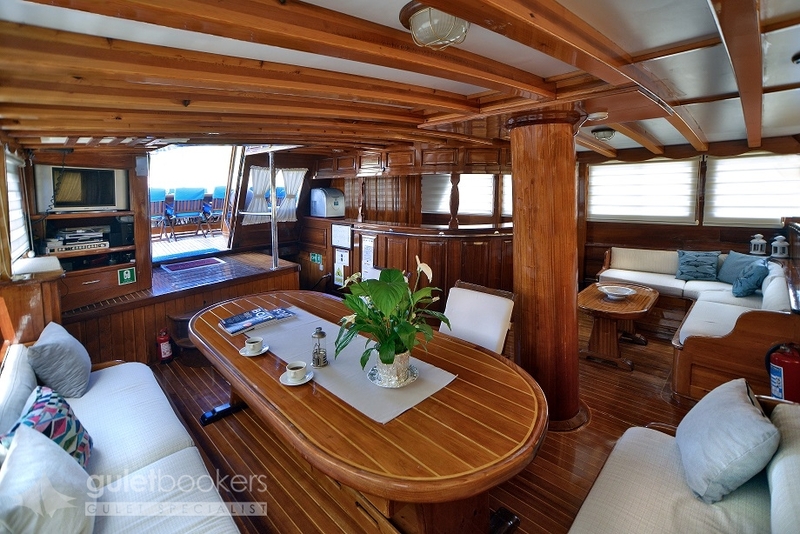 The air conditioned saloon has all the comforts with both an indoor dining table, a separate seating nook and the TV/DVD and music system. 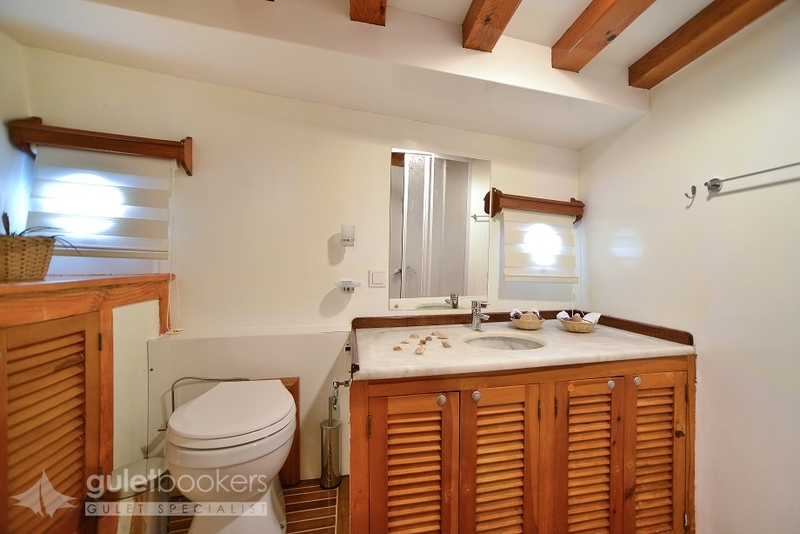 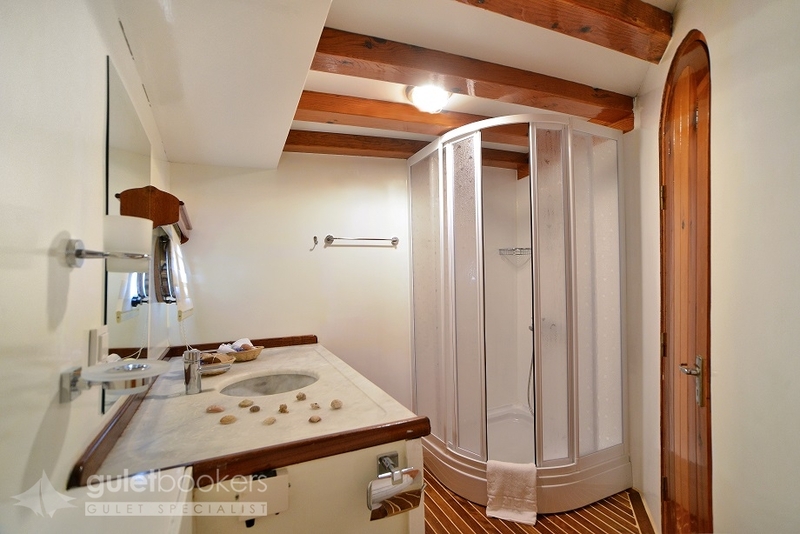 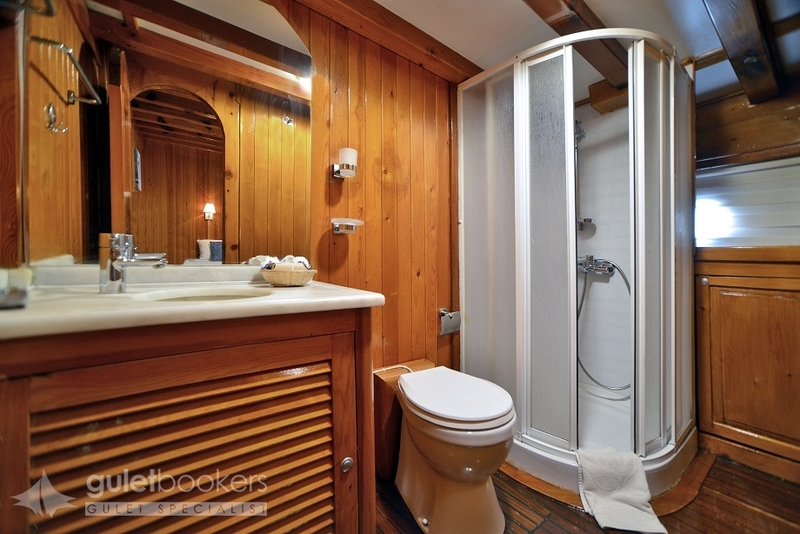 The six roomy, well laid out cabins all have air-conditioning and their own bathrooms. 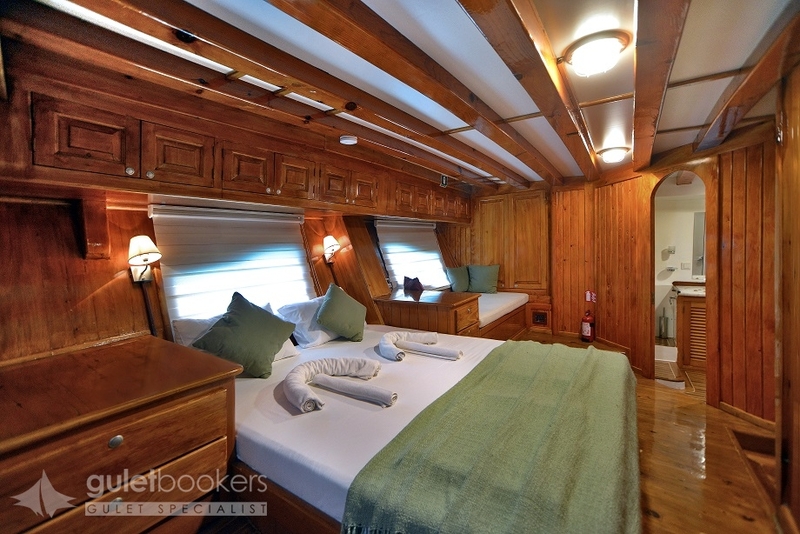 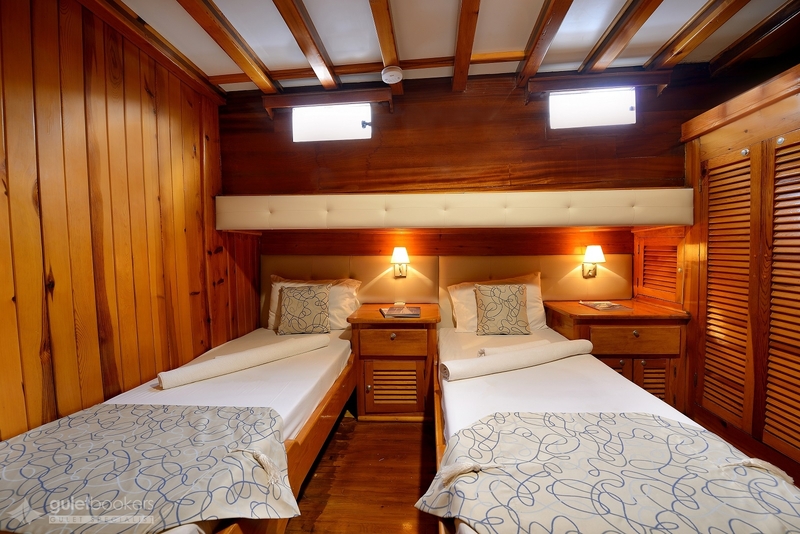 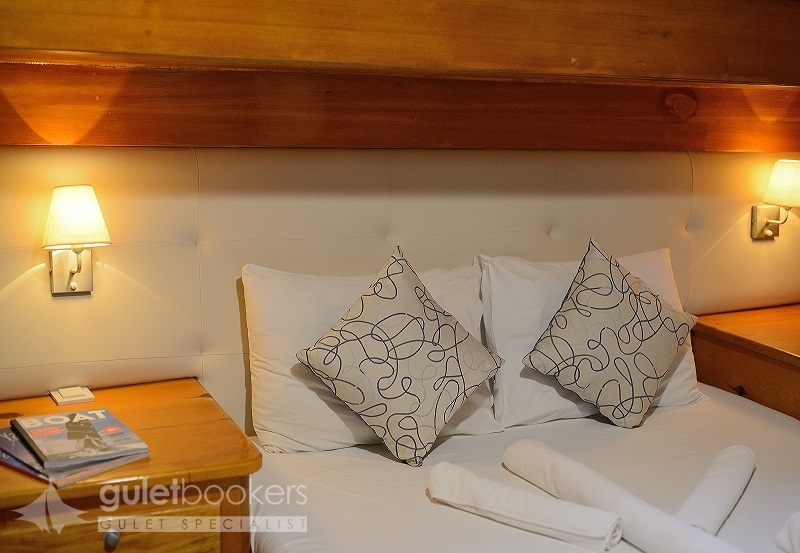 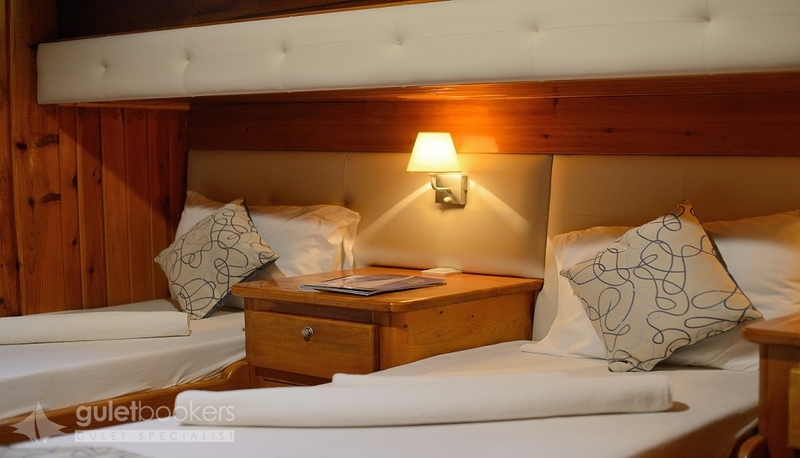 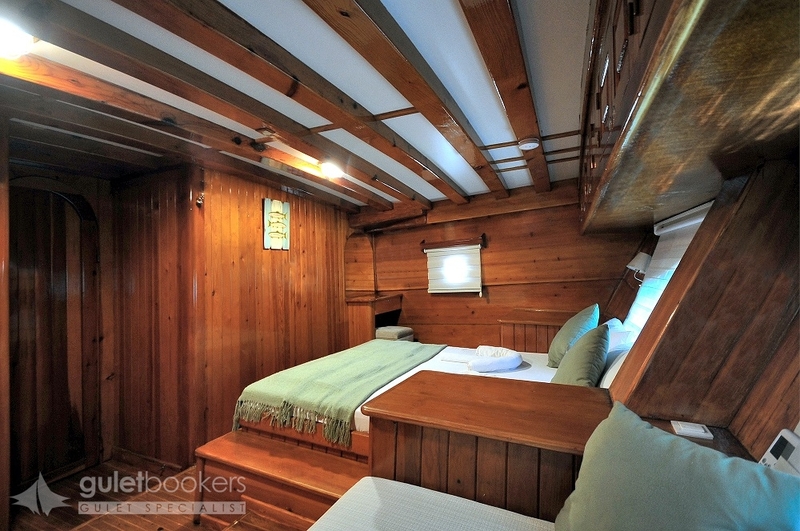 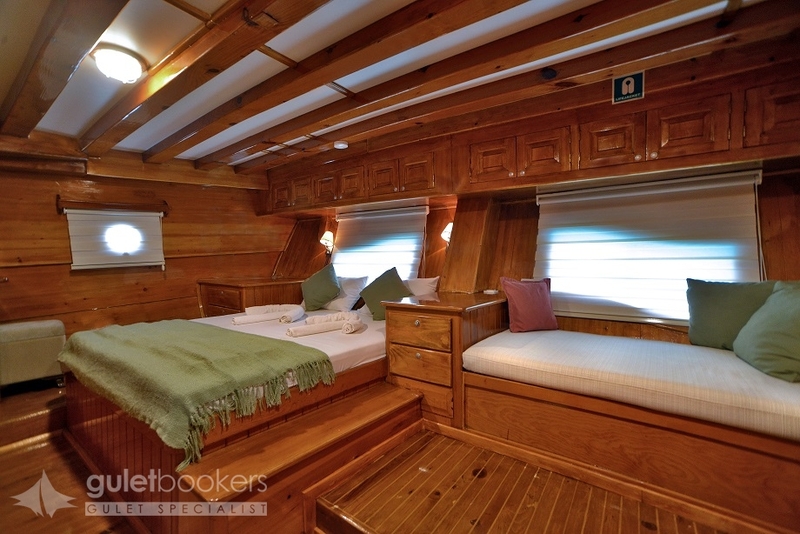 A practical arrangement of one master cabin, three double cabins and two twin-bed cabins will fit the needs of most groups or families who will find the cabins neat and nautical, lined with the warm honey coloured pine. 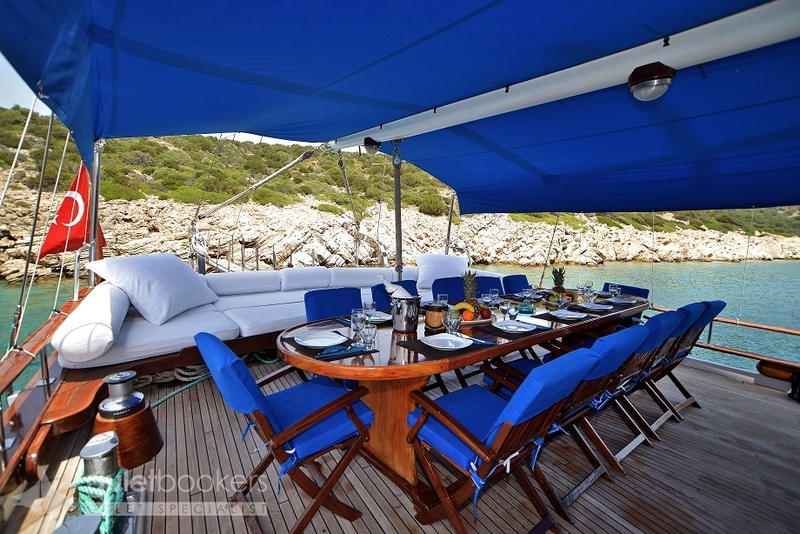 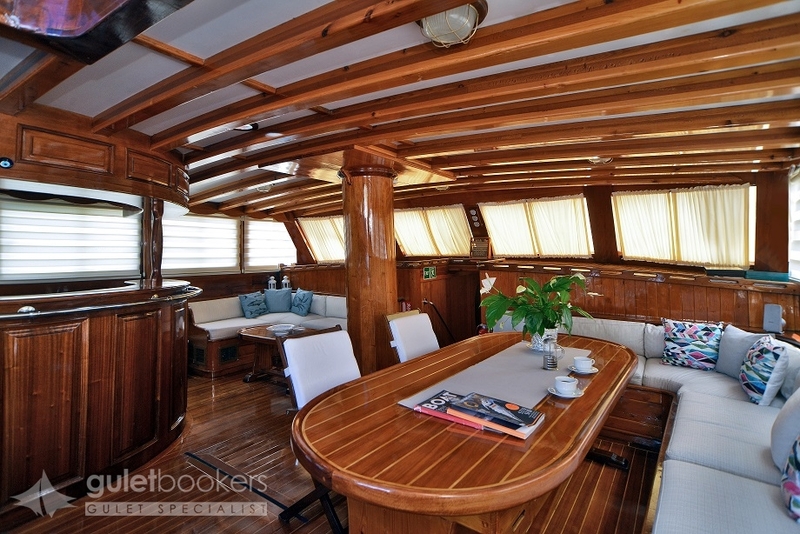 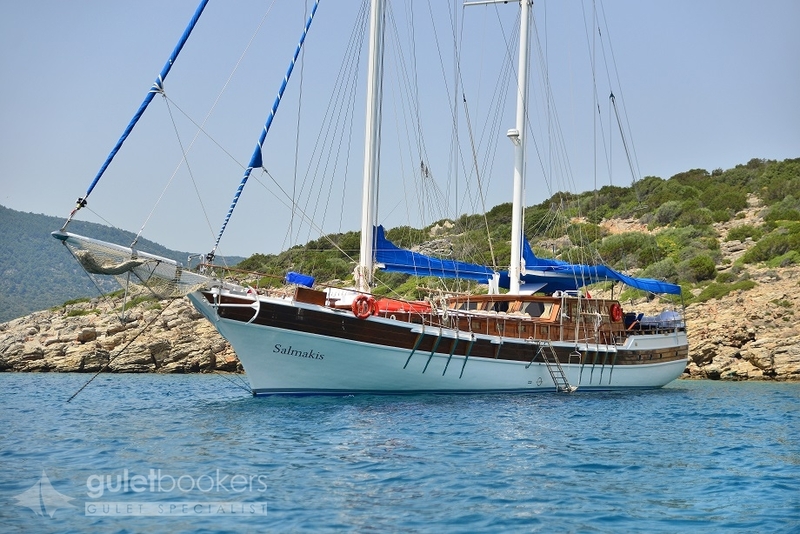 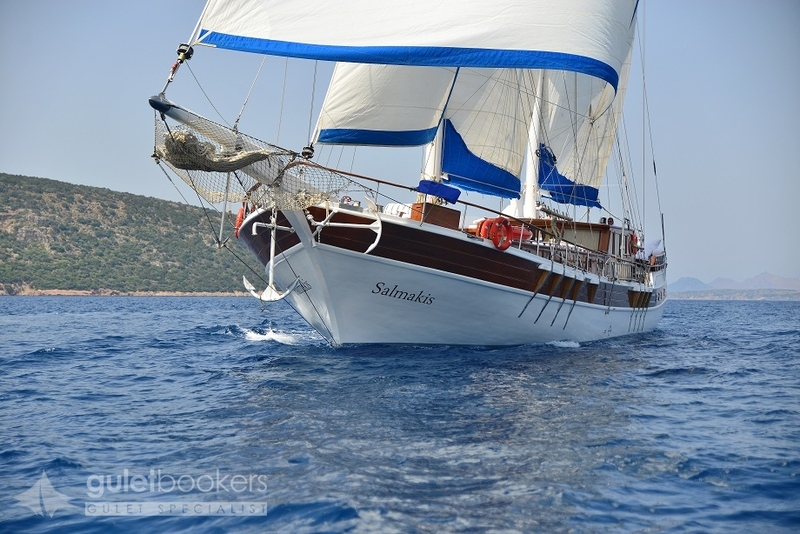 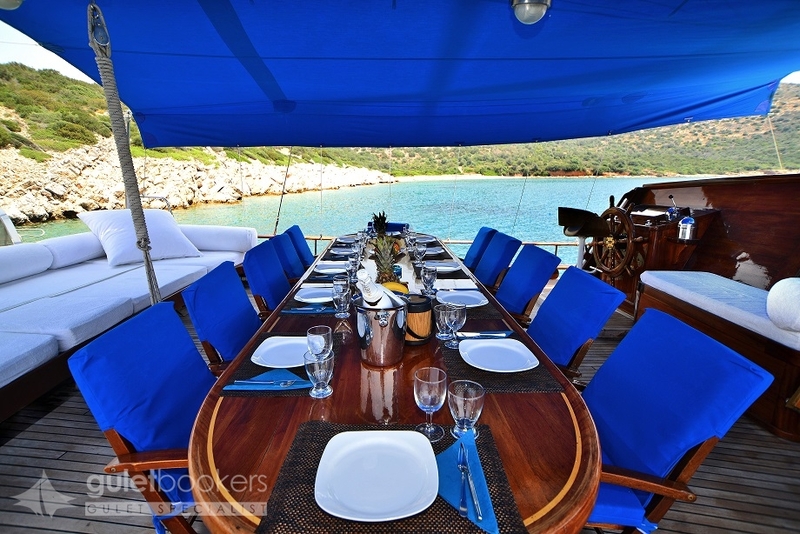 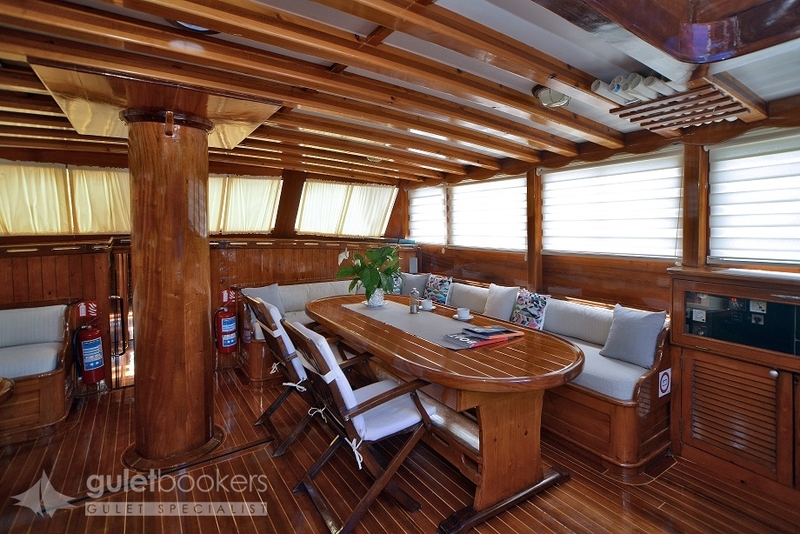 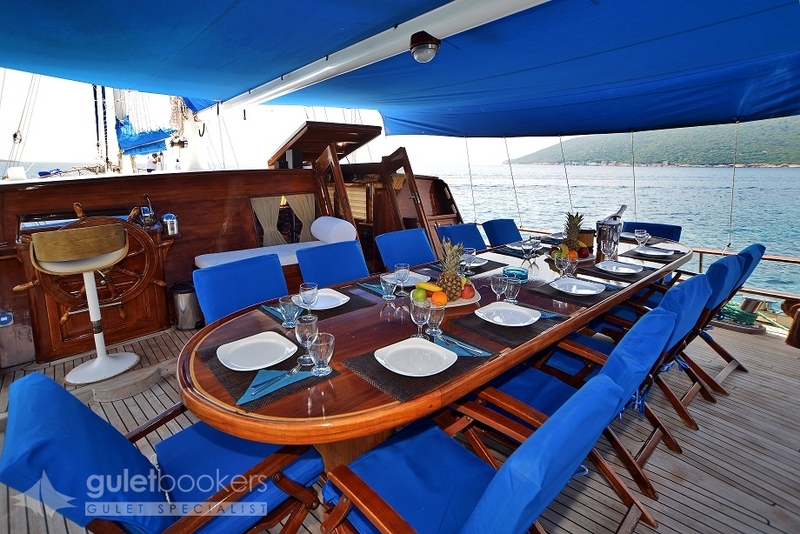 Elegantly styled, full of character, ideal for up to twelve guests, the Salmakis gullet has spacious deck areas which hold all the attractions of the relaxed holiday afloat with the aft dining table and inviting cushion bank under the shade awning, and the sunbeds and deck space up forward. 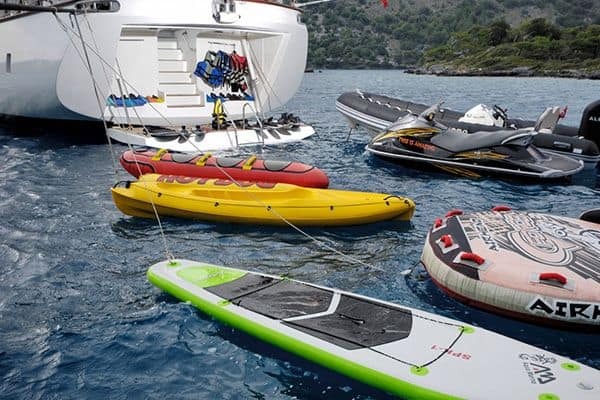 Canoes, fishing and snorkeling equipment can keep the energetic happy, or guests may request extra water toys to be added for the cruise. 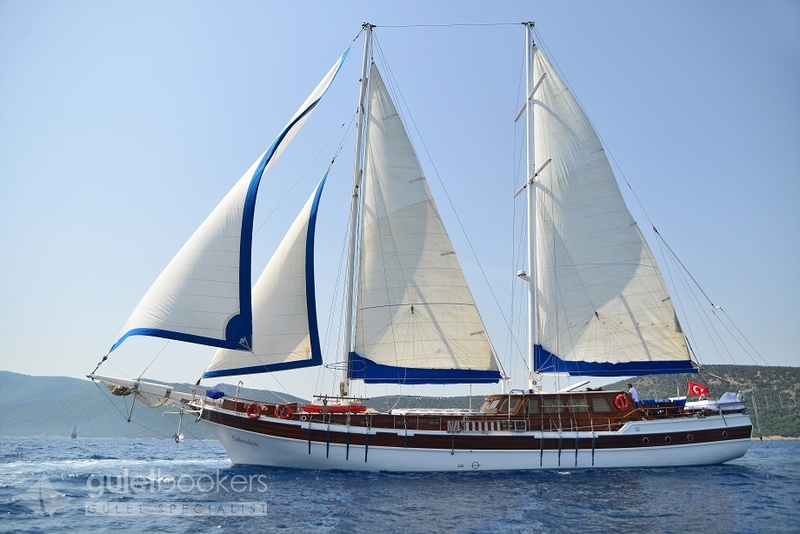 The captain and 3 crew on Turkish gulet Salmakis provide are very happy to put up the full set of sails on the two masted Salmakis where possible, and equally provide a fully professional but friendly service of all the meals, drinks cleaning and assisting with the guests’s activities to make a memorable holiday afloat.